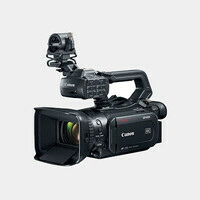 Combining a compact form factor, professional video features, and an HD-SDI output, the Canon XA35 is well-suited for "run-and-gun" ENG productions, event coverage, corporate videos, and other applications that require a compact, broadcast-quality camera. It is equipped with a 20x Canon optical zoom lens with a versatile 35mm equivalent range of 26.8 to 576mm, and features a 1/2.84", HD CMOS Pro sensor with enhanced sensitivity for improved low-light performance over the previous model. To fit into your workflow, the camcorders captures up to 1920x1080 video at 23.98p, 29.97p, 59.94p, and 59.94i frame rates, while also offering Slow and Fast Motion recording modes, as well as an interval recording option to capture fast motion of up to 1200x the original speed. In addition to the standard gamma recording mode, the XA35 offers Wide DR and Highlight Priority Gamma modes. Wide DR compresses high brightness areas to achieve a wider dynamic range of 600%. This not only helps suppress overexposure, but also produces smooth gradations in highlights and shadows, all while maintaining a finalized look that eliminates the need for post-production processing. The Highlight Priority Mode gives an HDR-like quality to your video by reducing the amount of highlight and mid-tone compression on the gamma curve, which helps to maintain highlight exposure. The mode also enhances brightness and saturation for more faithful color reproduction. A View Assist Mode is available to support this mode, enabling you to more accurately monitor what the final images will look like. The XA35 features both a 3.5" OLED Touch Panel view screen with a 10,000:1 contrast ratio, and a color electronic viewfinder with 1,560,000 dots of resolution. The camera features full manual control and auto modes for exposure, focus, white balance, gain, and shutter speed. The camera provides professional features such as a pre-record buffer, peaking, zebra bars, color bars, and reference tone. The zoom speed is adjustable with variable, constant (with 16 different speed levels), fast, normal and slow settings. The camera features a detachable top handle with zoom toggle, record start/stop, IR emitter, tally light, accessory shoe, external mic holder and two XLR connectors with phantom power and manual audio level controls. The XA35 includes a built-in headphone jack and a mini-HDMI connector, and outputs composite video and audio via a 3.5mm four pole mini jack. 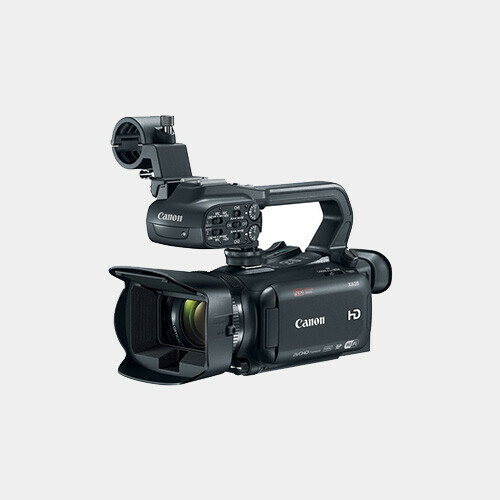 For connecting with professional video equipment, the XA35 also features a SD/HD-SDI output for direct connection to news truck, an SDI switcher, or other professional video equipment. 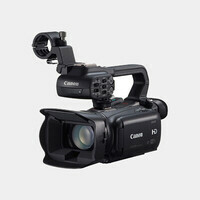 It also enables external recording of uncompressed video signals.